Daily, anti-virus companies are updating their definition files in order to protect their customers from potential threats. However, during those updates, there are false-positives that slip through the cracks and cause issues to arise with non-threatening software. In this last week, several anti-virus companies such as Avast, have updating their definitions and are now flagging Clipper and a few other applications on EliteMMO as malware. Firstly, I want to assure you that nothing on EliteMMO is infected or designed to be harmful. I've been making applications for the FFXI community for over 10 years now and never once have I infected someone or stolen anything. I pride myself on having a positive reputation in the community and will continue to honor that. My applications released for donators are protected with applications known as packers, obfuscators, and protectors. These applications alter the visible code of my programs in order to help protect from people stealing my work. While these protections are not flawless and do not protect against everyone, it does deter the drag-and-drop rippers from stealing my things. But, it comes with a cost. In some cases, these protections can be used on malicious files as well, which land up causing false-positives in anti-virus scanners. While Clipper is 100% safe, someone could release an app that uses the same protections which will generate similar code as the protections in Clipper, which now cause Clipper to be flagged as malware. - The application name and version that is being flagged malicious. - The anti-virus you use. - The version of the anti-virus you use if possible. - The version / date of the anti-virus definitions you are using if possible. Screenshots of the error/warning you get from the anti-virus are also helpful. And any other additional information you may have will be a great help. I will be working with the anti-virus companies through their false-positive report channels to hopefully get things cleared up as soon as possible. An update to the anti-virus issues. It appears that the protection/packer application that I use on one of the DLLs (EliteAPI.dll) is being marked as a trojan by a handful of anti-virus scanners. Sadly, these are all false-positives and the anti-virus software that is marking it otherwise is honestly just garbage. At this time, the biggest offender is Avira. This anti-virus is causing EliteAPI.dll to be marked as a trojan/malware and refuses to allow it to be whitelisted, stating that it has a confirmed trojan in it. Rather funny as they never even attempted to contact me and discuss the false-positive or potential threat. I do not recommend this software or company to anyone. It is clear that their practices are out to harm developers vs. work with them to resolve issues. They offer no contact method for developers that are falsely accused of virus' in their software to rectify the issues. They even mark EliteMMO.API.dll as malware when it is a .NET dll that is fully unprotected. You can go and download an IL decompiler such as ILSpy, Reflector, etc. and view the entire source code of that DLL. 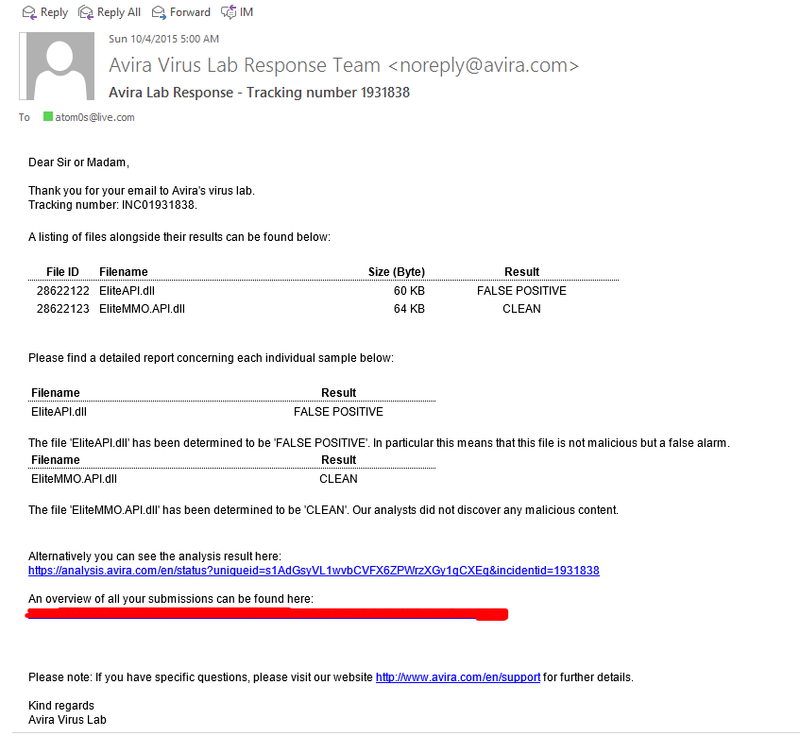 There is not a single line of malicious code in it anywhere, yet it is being flagged as malware by Avira. It is clear that their practices are not at all in favor of supporting other developers but rather locking peoples systems down from using legit software. I have submitted false-positive reports to several other AV companies and have had the issues fixed with some, and still awaiting answers back from others. Another update for Avira. This seemed to be the bigger offender from the reports I got. I have gotten an email back from their security team about my false-positive report. Just wanted to share this with those that use Avira (and other 'high' profile anti-virus software). So as you can see, they have confirmed both files are safe and that the EliteAPI.dll detection was indeed a false-positive.